Top flight action in the Nigeria Professional Football League returned to the Nasarawa State capital, Lafia, for the first time in over a year when Nasarawa United hosted champions, Rangers, following the completion of renovation of the Lafia Township Stadium. It was a match day two clash decided on Wednesday, January 18 and watched by a capacity crowd at the compact stadium. Wednesday’s match afforded the fans a chance to see their team and ended the two-hour journey to neighbouring Benue State, which served as their home ground during the 2015/16 season. Apart from the journey to Makurdi, fans also travelled to Abuja to watch the team in the 2016 Caf Confederation Cup. Unsatisfied with the state of the turf, the government of Governor Umaru Tanko Al-Makura decided to modernize the facility with an astro-turf surface, which is one of the best in the country. Despite the challenges of playing away from home, the squad played a beautiful brand of football and recorded decent results in Makurdi to the admiration of the state government. Interestingly, the team which is under the Isaac Danladi led management and coached by Sulaimon Kabir Dogo finished as runner-up in their first-ever Federation Cup final, in 2016. This served as an improvement in their Cup record after missing out in 2015 when they lost to eventual champions, Akwa United, in the semi-finals. On the eve of the season, the state Deputy-Governor and ‘Pillar of Sports’ in Nasarawa State, Mr. Silas Agara, inspected the facility to ascertain the level of work done. Agara had earlier expressed satisfaction that the work will be completed before the commencement of the season. Wednesday served as a new beginning for the young club which has recorded modest achievements in recent years. Trust the fans, they were excited to see matches in the top flight after a season without action in Lafia. Homeboy, Adamu Hassan, hit the curtain-raiser to brighten faces at the stadium and put his name in the history books. However, Rangers denied the fans a chance to celebrate the return in style as Fortune Omoniwari’s equalizer cancelled Hassan’s opener. The fact that the team is back in Lafia is a welcome development and well appreciated by the players, said centre-back, Abdulbasit Shittu. “It is good to play on home ground because of the supporters who are always present to cheer players. The degree of support in Lafia cannot be compared to what we got at Makurdi, last season. 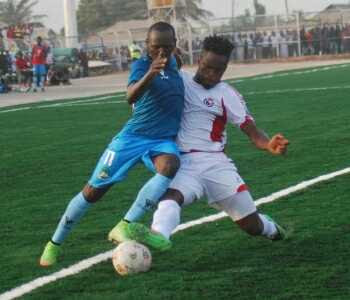 “Moreover, the Lafia turf is modern and better than that of Makurdi”, Shittu told naijaleague.com.ng. Club top scorer, last season, Abdulrahman Bashir, also expect more support in front of the home fans. “Our fans are excited as the team played home matches away in Makurdi for a year. The fans need to know players in their favourite team. “The match against Rangers marked my first ever home match for Nasarawa United, in Lafia. It’s a new turf and we need to train regularly to adapt to it. “My sincere gratitude goes to the Governor Al-Makura for making it possible for us to return to Lafia”, he said to naijaleague.com.ng. Courtesy of the administration of Governor Al-Makura, Nasarawa United joins the exclusive list of clubs that play on astro-turf in the NPFL. In addition to the turf, the dressing and medical centre were also refurbished to meet the challenges of modern football. Indeed, Lafia is back in the groove.